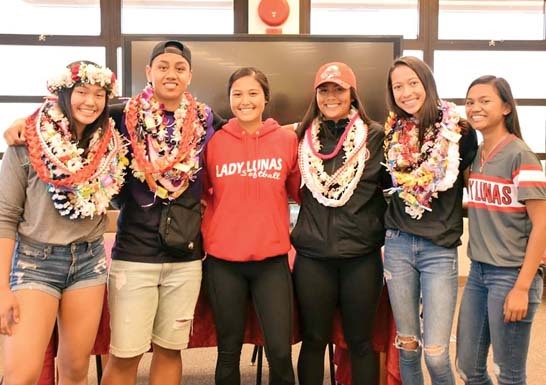 FIRST PHOTO: Kamehameha Schools Maui students (from left) Analis Nitta, Iokepa Supnet, Makena Pang, Talia Leauanae and Kaylee Cambra pose for photos during a signing ceremony Wednesday at the Pukalani school. Nitta (track) is headed to Redlands University, Supnet (baseball) is going to Whitman College, Pang (volleyball) will attend Mid America Nazarene University, Leauanae — who also participated in a signing ceremony on Tuesday with Hawaiian Style Volleyball Club — signed with the University of Alaska Anchorage, and Cambra (basketball) is headed to Tacoma College. SECOND PHOTO: Seabury Hall’s (from left) Isaiah Payne, Taysia Pimentel and Kyra Cambra smile during their signing ceremony Wednesday. Payne (track) signed with Seattle University, Pimentel (rowing) is headed to San Diego State and Cambra (soccer) will attend Oregon Institute of Technology.